It is with a great honour and privilege that we will welcome newly appointed Mr. Ian Burney, Ambassador of Canada to Japan to speak to us. At this luncheon meeting, Ambassador Burney will talk about updates of the Canada-Japan relations and future perspectives. 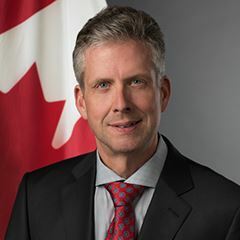 His career includes experiences in Asia, and numerous roles in trade policy such as Director General of the Bilateral and Regional Trade Policy Bureau, Chief Trade Negotiator (Bilateral and Regional) in the Trade Policy and Negotiations Branch, Assistant Deputy Minister of the International Business Development, Investment & Innovation Branch, Assistant Deputy Minister, Trade Policy and Negotiations, and Assistant Secretary to the Cabinet in the Economic, and Regional Development Policy Secretariat in the Privy Council office. Mr. Burney was appointed and presented his credentials as Ambassador in September 2016. Light buffet lunch and drinks will be served. How to register: Please email your name, organization, and title to admin@japansocietycanada.com by Monday, February 6, 2017. We are very pleased to advise that this presentation is being hosted by The Japan Society, with the co-operation of the Japan External Trade Organization, the Canada–Japan Society of Toronto, the Office of the Consul General of Japan in Toronto, The Japan Foundation and the Toronto Japanese Association of Commerce and Industry.